About 3 months ago, I made my first ever Stuffed Bell Peppers, rediscovering something that I hated as a child. I think it may have been the minute rice that my folks used or maybe the peppers weren't par-boiled. Nonetheless, I loved the recipe which I found at What's Cooking Chicago? 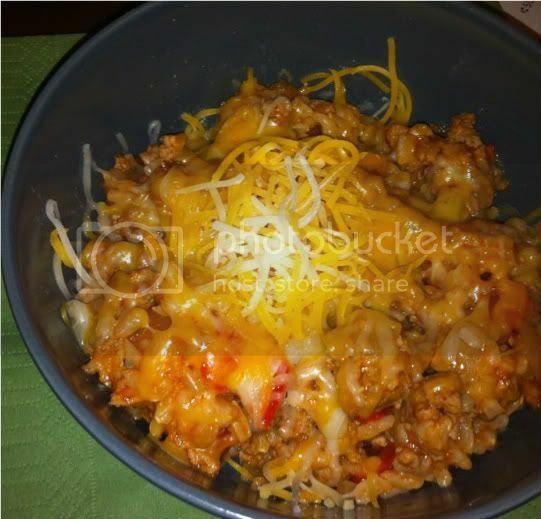 This time, I followed a recipe from Finding Joy in My Kitchen entitled "Unstuffed Pepper Skillet", making only minor adaptations based on what I had on hand and the order I added some of the ingredients. I loved this recipe nearly as much as the real deal, as did my husband. Plus, I was able to throw it together in about half an hour using precooked or leftover brown rice, which is always a plus for a weeknight. Sorry for the poor picture. I'm still unpacking and have misplaced the digital camera. Saute onions and carrots in olive oil for 2 minutes or so until they begin to become tender. Add turkey, sprinkle with salt, pepper, oregano, and basil. Continue cooking until turkey is browned and cooked through. Add peppers and cook for a minute. Add water, tomato sauce, and chili powder. Bring to a boil and simmer, covered, on low for 10-15 minutes until veggies are tender. Stir in rice and cook on medium-low until heated through, about another 10 minutes. Serve with a sprinkle of cheese.